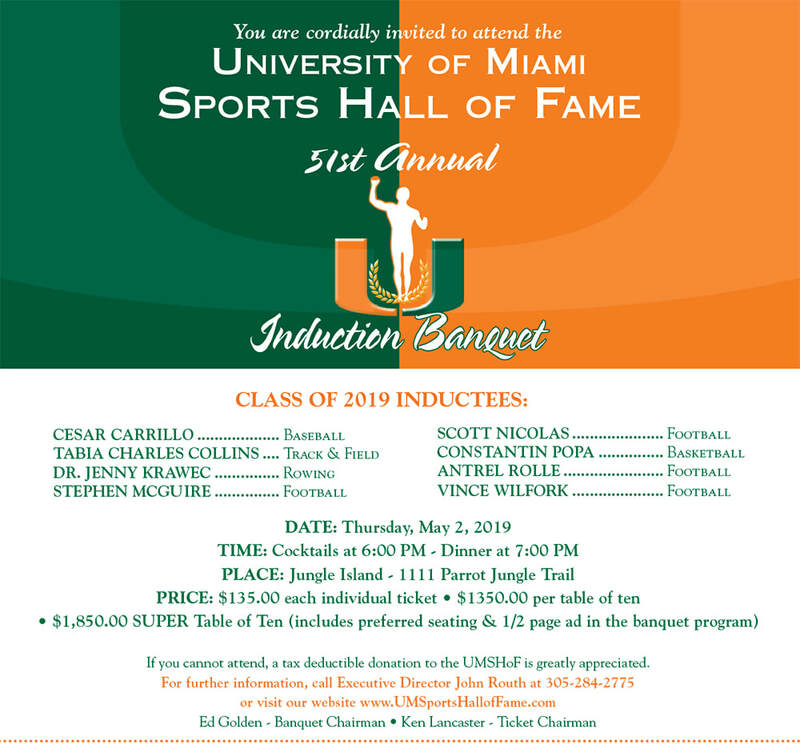 CORAL GABLES, Fla. -- The University of Miami Sports Hall of Fame has announced its Class of 2019 inductees for the 51st Annual UMSHoF Induction Banquet this coming spring. The eight-member Class of 2019 is comprised of Cesar Carrillo (baseball), Constantin Popa (men's basketball), Scott Nicolas, Stephen McGuire, Antrel Rolle and Vince Wilfork (football), Tabia Charles Collins (track & field) and Dr. Jenny Krawec, the first rowing team member inducted. This year's class was formally introduced during an on-field ceremony at the end of the first quarter of the Miami-Duke Homecoming football game on Saturday, November 3rd at Hard Rock Stadium as part of the "Hall of Fame Game" ceremonies. Started his UM career by winning 24 consecutive games, one shy of the NCAA record. Went 12-0 with 2.69 ERA in 2004 and began 2005 winning his first 12 games to move his career record to 24-0, the fourth-longest winning streak in NCAA history. Named the ACC Pitcher of the Year for 2005 with a 13-3 record and a 2.22 ERA with 127 strikeouts in 125 innings. Was also a finalist for the Roger Clemens Award as the nation's top pitcher. Finished his career with a 25-3 record and is 7th all-time with a 2.44 ERA. A first-round draft pick (18th overall) by the San Diego Padres in the 2005 MLB Draft, he made his major league debut in August, 2009. The Toronto, Ontario, Canada native was named a 10-time All American in two different events, the Long Jump and the Triple Jump, earning the 2006 NCAA Outdoor Championship in the Triple Jump. Tabia was the 2004 Big East Indoor and Outdoor Triple Jump champion, along with the Indoor Long Champ title. She also claimed ACC titles in Indoor Long Jump (2005), Indoor Triple Jump (2006), Outdoor Long Jump (2006) and Triple Jump (2006). She graduated UM in three years and went on to compete for her native Canada in the 2008 Olympics, finishing 10th in the Long Jump. The first ever inductee from the sport of rowing, Krawec is Miami's first and only All American as she was named second-team All-American by the Collegiate Rowing Coaches Association (CRCA) in both 2003 and 2004 in the women's Varsity Eight. The native of St. Catharines, Ontario, Canada was also named NCAA All-South first team in 2002-2003 and CRCA All-South first team in 2003-2004. Dr. Krawec is currently a professor in the UM Education Department, having earned her undergraduate degree, Master's and Doctorate in Special Education from UM. 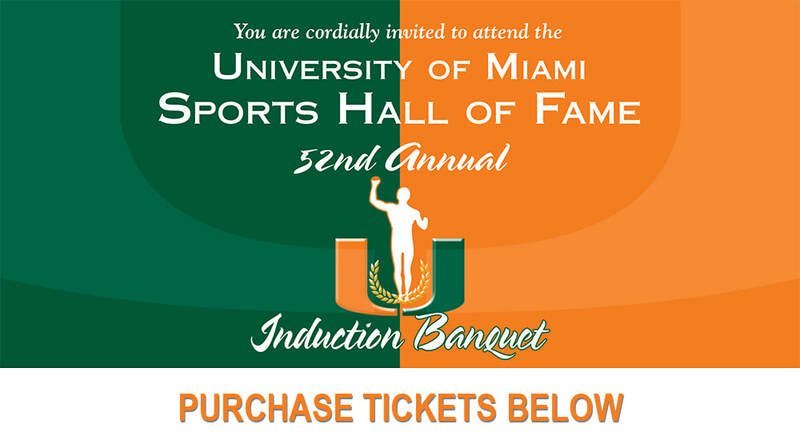 McGuire left UM as the school's second leading all-time rusher (now #14) with 1,953 yards, trailing only the great Ottis Anderson (3,331) in the category. He still holds the school record with 35 career rushing touchdowns and is tied with Edgerrin James for total touchdowns (35) in the school's record book. A member of both the 1989 and 1991 National Championship teams, Stephen averaged 4.9 yards per carry for his career. He now serves as a New York City police officer. Still Miami's third leading tackler of all-time, Nicolas left UM as the school's leader, having dethroned the legendary Ted Hendricks in the category. He led the team in tackles three consecutive years (1979-1981) and set a school record with 26 total tackles in Miami's upset road victory over Penn State in 1979. Drafted by the Cleveland Browns in the 1982 NFL Draft, Scott played six seasons in the league with the Browns and Miami Dolphins. A member of Coach Leonard Hamilton's first recruiting class, Popa was a key player in the Hurricanes' first postseason team since the rebirth of the basketball program in 1985. A four-year starter at center, he led the Canes in rebounding and blocked shots all four seasons. Known as a defensive player, he averaged 10 points a game for his career. Twice named All-Big East third team, he is a member of the school's "1,000 point club". He is one of the Canes all-time fan favorites. Named a consensus First-Team All-American in 2004 and was also named the winner of the Jack Tatum Award as the best defensive back in the country; was a finalist for the Jim Thorpe Award (nation's best defensive back); and a semifinalist for the Bednarik Award for the best defensive player in the nation. Antrel was named a first-team All-Big East selection in 2002 and a first-team All-Atlantic Coast Conference (ACC) selection in 2004. The eighth overall pick in the first round of the 2005 NFL draft, he spent 11 seasons in the league and was a three-time Pro Bowler. A member of the 2001 National Champions as a freshman, Vince finished 10th on the team in tackles with 41. In 2002, had 15 tackles for loss and was tied for second on the team with seven sacks. Named a 2003 preseason All-American and compared to UM great Warren Sapp, Wilfork faced double and sometimes triple teams throughout the season but still finished fourth on the team in tackles (64), second in tackles for loss (11.5), second in sacks (6) and led the team led in quarterback hurries (20). He was named a first team All-Big East selection. Vince was the 21st overall pick in the 2004 NFL Draft by the New England Patriots and spent 13 years in the NFL, winning two Super Bowls and earning five Pro Bowl berths.